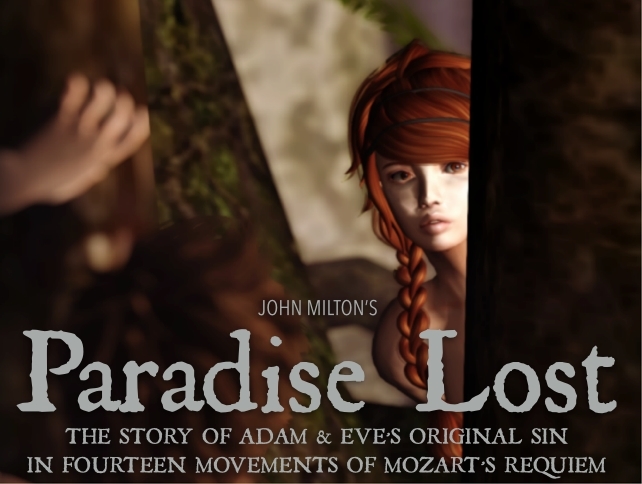 On Saturday March 29th 2014, I was one of a number of people privileged to witness a special preview of The Basilique Performing Arts Company’s production Paradise Lost: The story of Adam and Eve’s original sin, which as I’ve covered in the blog, is an ambitious attempt to visualise Milton’s epic 10,000-word poem Paradise Lost through the medium of dance set to the Süssmayr completion of Mozart’s Requiem Mass in D minor. By the time of the preview, I’d covered some of the technical complexity of bringing together the production, which features some 43 roles on-stage, plus audience participation as those hosts of both heaven and hell, and Caitlin Tobias had been covering a lot of the behind-the-scenes news on the production. So, needless to say, anticipation was running high as I joined the rest of the audience for the event. This is not something you should risk missing. It’s. That. Good. Act Three: the war between the hosts of heaven and hell; Adam and Eve’s despair; Michael’s revelation to Adam of future events leading up to man’s redemption to God through Christ. Adam and Eve venture forth into the world with their baby sons Featuring Domine Jesu, Hostias, Sanctus, Benedictus, Agnus Dei and Lux Aeterna. These acts are played out in three stage areas – hell to the right of the audience, Eden to the left, and the world beyond the gates of Eden to the front. Extensive and agile use of scripting is made such that the various sets fade in and out as required, and even the floor of the theatre itself is rendered transparent in order to help visualise the Flood as revealed to Adam by Michael in the third act. The positioning of the stage areas like this serves two purposes – one obvious, and the other perhaps more subtle. The more subtle aspect is that it places the audience physically between the damned and the divine, precisely as someone of Milton’s mindset might well see humanity. The other aspect is that it places the audience squarely in the middle of events, which unfold to their left and right and even overhead, as well as in front of them, enhancing the sense of immersion in the story. The immersive element is further deepened by the fact the audience has a role to play in the proceedings, a feat achieved through the creative use of the Restrained Love (RLV) API. Each ticket purchased for a performance includes an avatar set, which audience members are asked to wear when attending a performance. Initially the guise of an angel, RLV is used to make the avatar to change to that of a demon and back as the story moves between the two stages representing paradise and hell, without any intervention on the part of the wearer. RLV also enables the audience to effectively become the chorus within the story. As a visualisation – given the music selected for the intermissions between the acts (a beautiful rendition of McCreary’s Passacaglia, itself preceded by The Shape of Things to Come prior to the performance commencing), I’m almost tempted to say reimagining of Milton’s poem – one of the most striking elements of this production is how well both the elements of the poem presented within the performance sit with Süssmayr’s completion of Mozart’s Requiem. While Becky, Harvey and I discussed something of the complementary nature of the two works when placed together in this way (see the conversation linked to above), it is not until one sees the performance in full that it becomes clear just how apposite the Requiem’s movements are to the unfolding story. As a reimagining, there are also some changes to the narrative which may well sit a little uncomfortably. Satan, for example is portrayed a female. While there are artistic reasons for this, such as perhaps making Satan more sympathetic when in human form, aligning the production somewhat with the Romantic interpretations of the poem, it is a shift which carries a subtext of meaning which it comes to the seduction of Eve, which now becomes a sexually charged, sensual dance between two women. So what could perhaps be said to have been a fall of equal parts – Eve unable to overcome the (male) Satan’s beguiling and persuasive words and Adam’s inability to prevent this – now shifts the emphasis of blame more squarely onto womankind. This shift in emphasis is again apparent in Act 3, wherein the female Satan tempts Christ not with words or promises, but with a sensual and provocative dance. By transforming Satan into a female form, the production might be said to gain something of a Tertullian subtext with a literal twist: not only are women “the devil’s gateway”, they are the devil incarnate. However, it would perhaps be wrong to read too much into these changes in terms of intent on the part of the producers. This is, after all a production that relies on a portrayal of events through dance and music, rather than through the words of blank verse. One might even say that the artistic changes evidence in gender are in fact a subtle critique of the Patristic age and its view of women. There is also, understandably, some truncation of the story as well – most notably in Act 3, when Michael reveals to Adam all that is to come up to and including mankind’s reconciliation with God through Christ. However, this is not to say anything essential is lost from the narrative when compared to the poem. For those not overly familiar with Milton’s epic word and who might be put off by thoughts of not understand what is happening – fear not! Each act is framed by a very brief voice-over which provides necessary context without over burdening the listener. Or if you prefer, Canary provides an excellent summary of the work. Nor is this a dry piece; the choreography is exquisite, the depth of immersion captivating and the richness of the production a sheer marvel – and for the keen-eyed, there is even a moment or two of light relief. 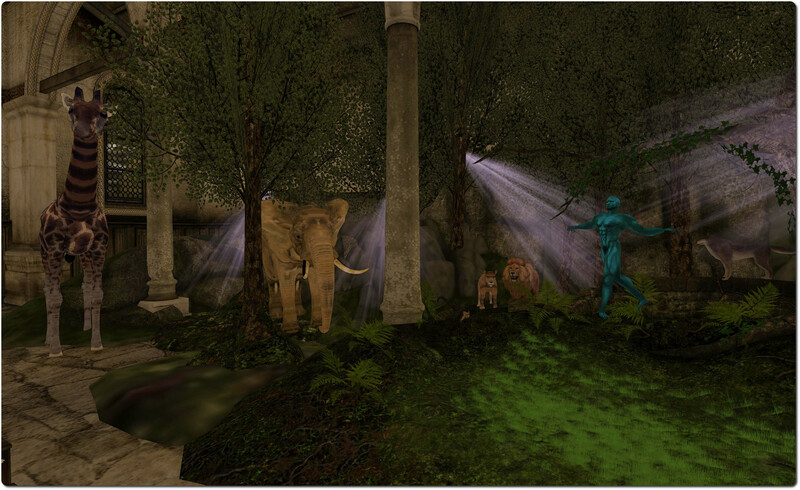 Paradise Lost premieres on Saturday April 5th at 12:00 noon SLT for a run of 12 performances through April, May and June 2014. At the time of writing, some nine performances of the premiere season remain with tickets available. These cost L$1,000 per person per performance, which includes the necessary avatar costume, and can be obtained via the SL Marketplace. and fifty percent of which goes directly to support the Basilique’s adopted baby mountain gorilla through the World Wildlife Fund, and the remaining 50% goes to the cast and production. Again, I cannot recommend this production highly enough. 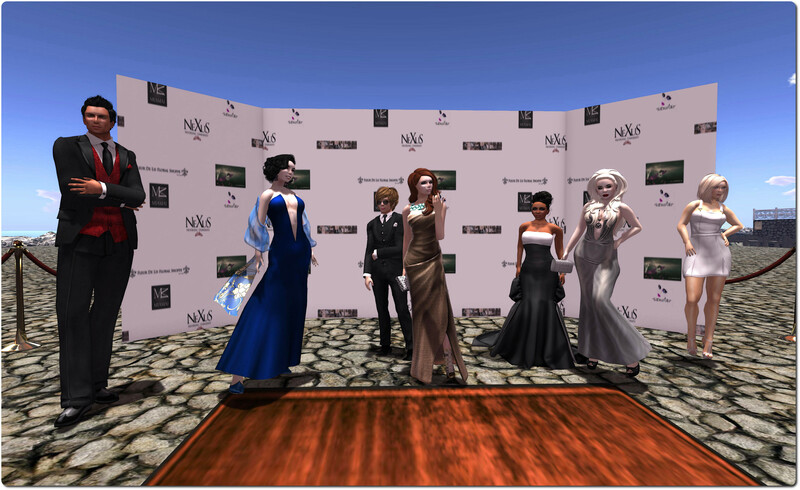 It is a genuinely remarkable experience, one which demonstrates the sheer power and capabilities of Second Life as a venue for complex, immersive visual and performing arts. Canary, Harvey and the entire cast are to be congratulated on realising such an amazing production. In preparation for the premiere, Canary and Harvey and Paradise Lost were featured in the latest segment of The Drax Files, and I’ll leave you with that as a further teaser. With apologies to Canary, Harvey and the cast for the belated appearance of this review. Previous Post Petrovsky’s future in Flux? 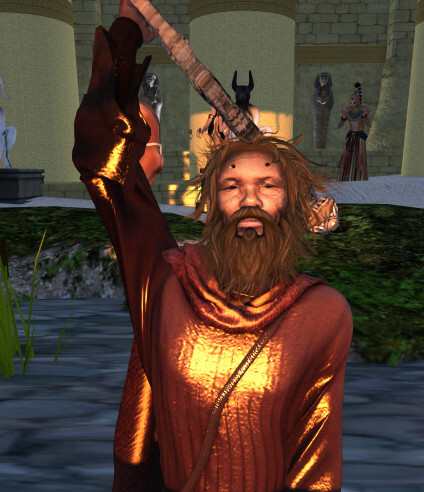 The title says it all really… an excellent and insightful review by Inara Pey. Will also say I thoroughly enjoyed the Saturday premiere as well! Bravo, all! Saw the performance on Sunday the 6th of April. It was a FANTASTIC! At every juncture in the performance I could see how much effort has gone into this production to make it entertaining, engaging, immersive and spellbinding. Congratulations to the Basilique Performing Arts Company on achieving a truly unique theatrical experience. As an Australian, I had to get up at 4.30 am to see the show – but I’d come to all of the sessions if I could!